Kathy Brown is a prolific writer about the diverse uses of the Brain Gym® program for more fulfilling life at any age, and other topics relating to child development. 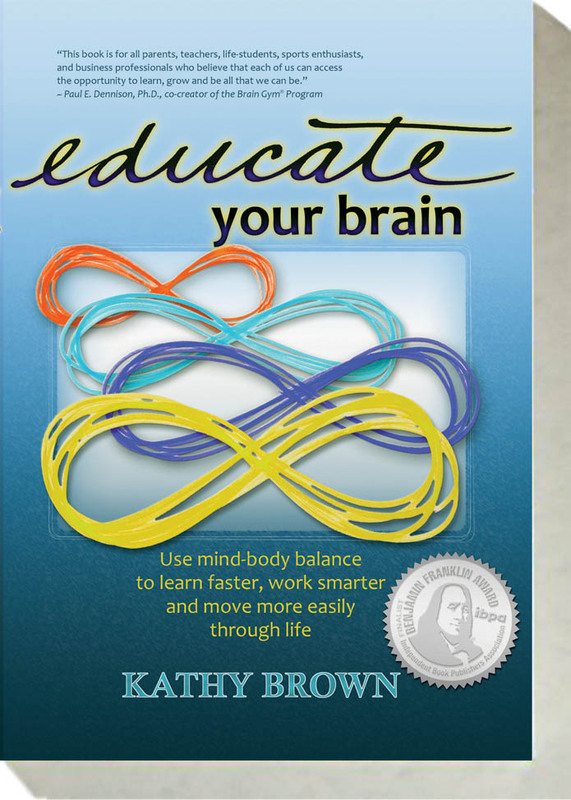 Kathy’s award-winning book, Educate Your Brain, shares the simplified basics of the Brain Gym® program, and offers tools and techniques that you can use immediately to Brain Gym into your life. It’s perfect for those who want to learn about the potential of this remarkable work, while also providing resources of great value to the seasoned Brain Gym practitioner. Learn More – and view sample pages. She is currently working on her second book, Educate Your Brain for Reading, about how to use the dynamic Brain Gym process specifically to overcome blocks to reading. CLICK HERE for a free download of Chapter 18 of Educate Your Brain. In her blog, Whole-Brain Living and Learning, Kathy offers a collection of articles focused primarily on elements of the Brain Gym program, but also offering thoughts on diverse aspects of the relationship between mind and body. Articles Kathy wrote for her newsletter (prior to beginning this blog) are available, as well. Some have been updated as blog entries. Note: Please expect an email from MailChimp. You will need to click on it to finalize your subscription.